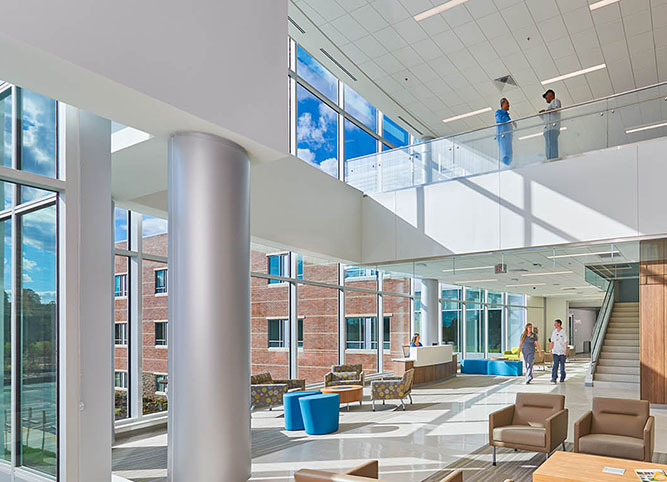 The VCU Health Community Memorial Replacement Hospital has been selected to receive an Award of Merit in the Health Care subcategory for ENR MidAtlantic's 2018 Best Projects. It was nominated by DPR Construction, the general contractor, and designed by SmithGroup. McMullan provided structural engineering services for the new hospital which was designed to accommodate future expansion, as needed. The hospital is acclaimed for having the most advanced cardiac care in the region with a permanent cardiac catheterization lab and diagnostic services that include MRI, CT, nuclear medicine, cardiac, vascular and pulmonary studies. ENR MidAtlantic had two panels of industry judges review 82 projects located throughout the region, including Delaware, Maryland, Pennsylvania, Virginia, West Virginia, and the District of Columbia. The judges—including an architect, engineer, contractor and a specialty contractor—were divided into two groups and assigned a group of categories. Projects were evaluated on the ability of the project team to overcome challenges, contribution to the industry and community, safety and construction and design quality. All of the 2018 Best Projects and their teams will be honored at an awards presentation and luncheon on November 7 at the Hyatt Regency Baltimore Inner Harbor.